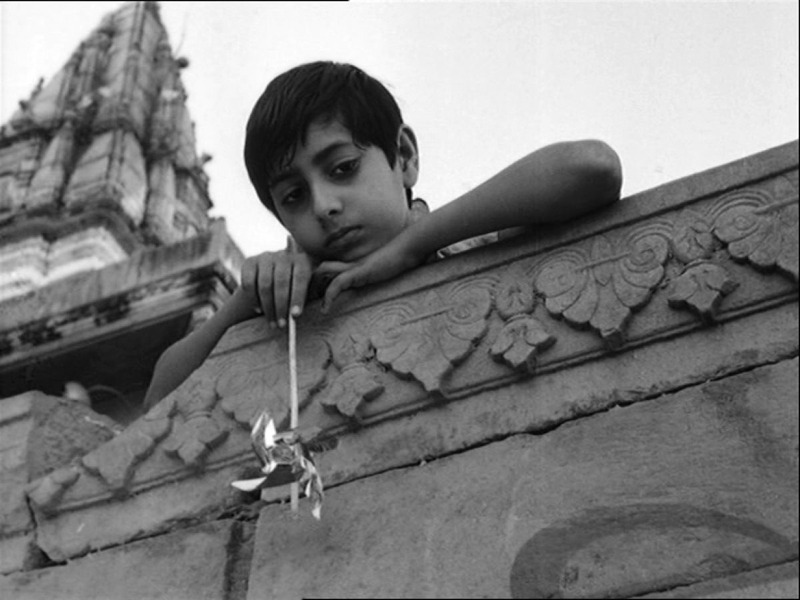 The Leeds Film Festival showed the restored version of Aparajito in the 60th anniversary year of its appearance on the world stage. 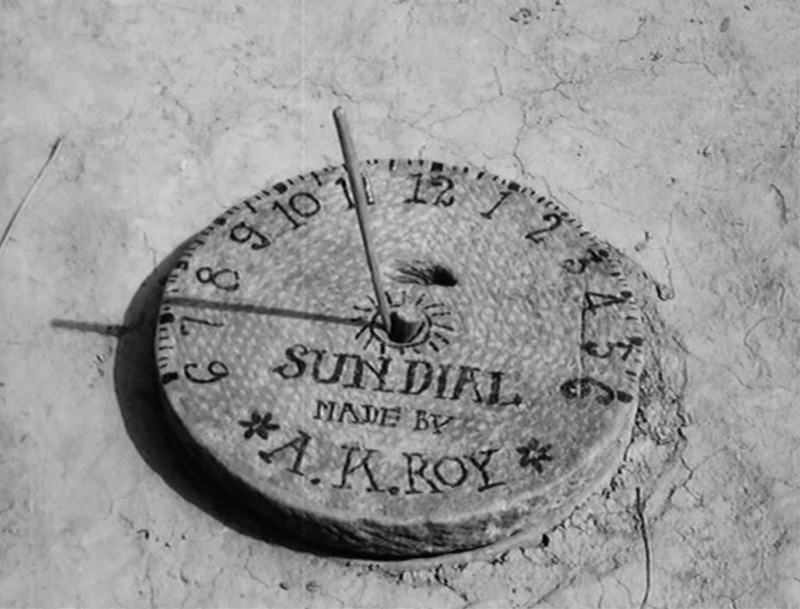 Satyajit Ray’s film, the second part of his Apu trilogy, received many prizes on its first appearance and much praise from cinephiles over the following decades. This was initially mainly from international rather than Indian audiences, though a balance has since been restored. As such a revered classic, there is a danger that an audience now might take it for granted. Personally, I found that the restoration, although it couldn’t overcome every aspect of the damage done to the original film following years of neglect, still managed to produce a print of startling clarity and I felt like I was watching a new film. As the second film to be based on the original novels by Bibhutibhushan Bandopadhyay, Aparajito (‘Unvanquished‘) bridges the two novels. Satyajit Ray did alter the narrative in significant ways. The young Apu has moved to Benares with his father and mother. Father works as a priest on the ghats, but quite quickly catches a fever and dies. Apu and his mother move back to the village of Apu’s great-uncle where the boy decides to abandon his apprenticeship as a priest and attend school. It is the final section of the narrative that Ray changed in terms of the relationship between widowed mother and son – and in doing so, alienated more traditional audiences. The presentation of Apu’s development and his eventual estrangement from his mother is very subtle and effective. I admire and respect Ray for what he achieved in this film, but I was most taken by Subrata Mitra’s camerawork (and the accompanying music by Ravi Shankar). The early scenes of Benares in what is meant to be the early 1920s are beautiful and make an interesting comparison with the recent film, Hotel Salvation (India 2017) also set on the ghats of Benares (now Varanasi). The later images of the village recall the train on the horizon as it was in Pather Panchali, but I was delighted to see images of Calcutta, including shots by the Hooghly River and on the Maidan. What is surprising (and possibly a result of the very limited budget) is the complete absence of any evidence of the British Raj in a city which up until 10 years earlier was the capital of British India and still the major commercial city of India. Perhaps this absence is one of the factors which gives the Apu Trilogy its ‘timeless and universal’ appeal? Ray hints at the impact of modernity on the adolescent Apu as he sets off for Calcutta clutching the globe given to him by his village schoolteacher and wearing his first lace-up shoes. In Calcutta he is delighted to find his room has electricity for lighting. All this is very effective, but what are we to make of the presentation of Calcutta without the crowds? Was it really so sleepy and deserted in the 1920s? Or again, is it just a matter of budget. technology and learning what can be done with the available technology? Marie Seton’s Portrait of a Director: Satyajit Ray (1971) has quite a bit to say about the innovations made by Ray, Mitra and designer Bansi Chandragupta in photographing the studio sets and matching them to location shots in Benares. The key was the discovery of so-called ‘bounce lighting’ using diffused studio lighting and reflectors to simulate daylight seeping into the Benares house. The outpouring of critical praise for the film in the West and the reluctance to recognise the ‘modernity’ of the relationships by the Bengali audience were indicative of the way Ray soon became institutionalised within the international ‘humanist art film’ movement of the 1950s. He also quickly became the kind of director who would be seen as an auteur, a ‘personal’ filmmaker. I haven’t read the original novels from which he took the Apu character but looking at the photos of the young Ray in Seton’s book, it isn’t difficult to see the young Apu (played by Sumiran Kumar Ghosal) as the same tall spindly young man who Ray was when going to Presidency College some ten years later in the 1930s. Apu even lives over a print shop where he works part-time. Ray’s family had once owned a printing and publishing business. I was also entertained by the university classroom scenes in which I finally learned how to explain the meaning of ‘synedoche’. 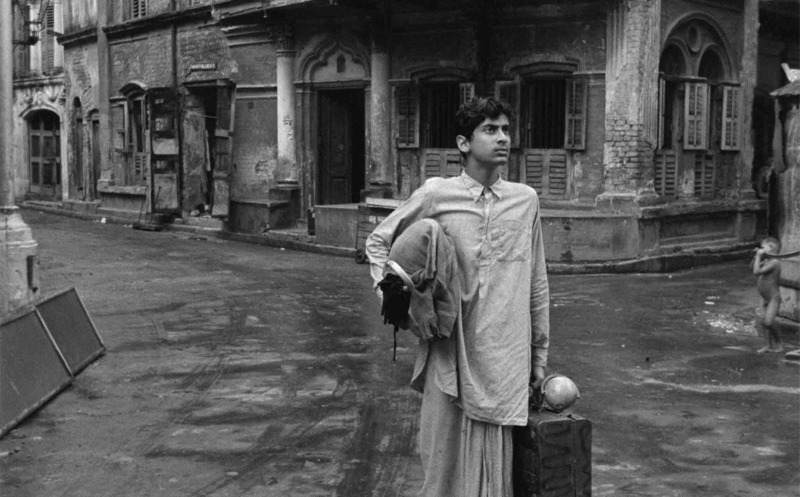 But in the end, Aparajito‘s greatest gift for me is to set the scene for Ray’s 1960s films set in Calcutta and before that the third film in the trilogy, Apur Sansar (The World of Apu, 1959). These notes were compiled for a Day School earlier this year that looked at extracts from various Indian films/films about India in an attempt to understand how the issues surrounding the Partition of India in 1947 have been represented on screens. 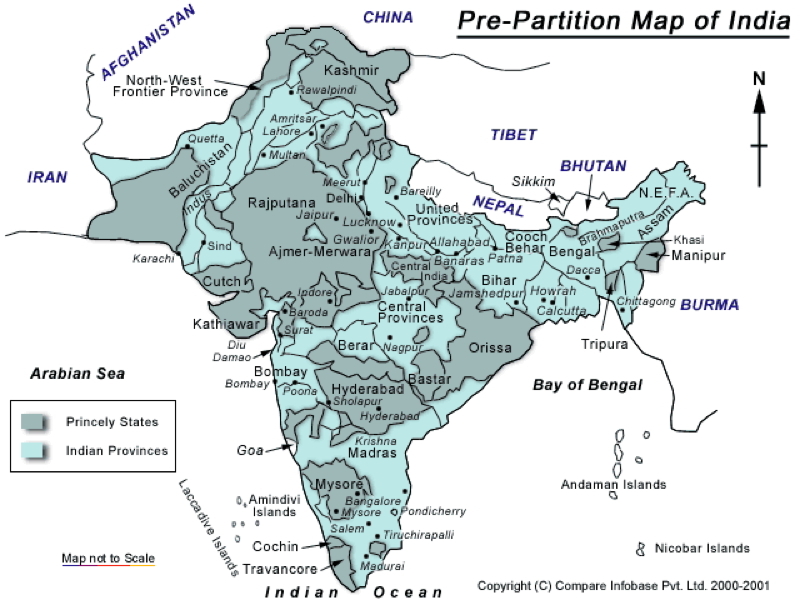 The ‘partition’ of India was the final act by the British colonial administration working through the India Office and the Viceroy (i.e. the King’s representative) in August 1947. The Viceroy then became the Governor-General of India still representing the King as the Head of State in the independent ‘Dominion’ of India. In Pakistan, Muhammad Ali Jinnah became Governor-General. The Labour government in London faced many severe problems in the immediate aftermath of war. The winter of 1946-47 was one of the worst on record in the UK and the heavy snowfalls in January severely disrupted industry and agriculture. As much as 10% of industrial output was lost, energy supplies were severely restricted. Public spending with the foundation of the National Health Service and the expense of military activity abroad (15% of GDP) created pressure on sterling and subsequent devaluation from $4.00 to $2.80 as the dollar exchange rate. Historians see this as the first stage in the UK’s decline as a superpower. Despite the enormity of the Partition of India as an event, it was only one of the problems facing Prime Minister Attlee’s cabinet (withdrawal from Palestine was also a priority). Mountbatten was given considerable powers and the government was prepared to accept a swift retreat from India. Communal conflict has been a feature of life in India at various times throughout recent history (much of it caused directly by British policies) and in August 1946 around 4,000 people lost their lives in Calcutta during clashes between Hindus and Muslims. The lack of action by the colonial authorities at this point is inexcusable, but the British state was increasingly running out of resources to police India effectively. Mountbatten was appointed Viceroy in February 1947, charged with achieving a British withdrawal by June 1948 at the latest. He accelerated the process of withdrawal in an attempt to avoid further violence – but instead probably exacerbated the conflicts. The leaders of the Indian Independence movement, including Nehru, Jinnah and Gandhi, had been pressing for independence since the 1920s and earlier. (The Congress Party and the Muslim League had origins in the late 19th century and early decades of the 20th century.) The emergence of a ‘two state’ solution is generally accepted to have happened because of the position that Jinnah and the Muslim League adopted in the early 1940s. Jinnah argued for a division according to religious affiliation because of fear that an independent India would be dominated by Hindus. Ironically, Jinnah himself was not a ’religious Muslim’ and the British had encouraged separate political constituencies for Muslims and Hindus and other religious groups as early as 1932 with ‘The Communal Award’. Congress could reasonably argue that Jinnah did not have the support of the majority of Muslims across India as shown in local elections, but he convinced the British that he was the Muslim leader they should negotiate with. Once partition appeared inevitable (i.e. when Jinnah and Gandhi /Nehru could not agree on how to negotiate with the Viceroy), the fundamental problem became how to divide the three provinces of British India in which there were roughly equal numbers of Muslims and Hindus. Punjab was further complicated by the presence of the home base of Sikhism in Amritsar. Bengal had already experienced a very unpopular earlier partition by the British along religious lines in 1905 (rescinded in 1911). Jammu and Kashmir was actually a ‘princely state’ – not under direct British control. India and Pakistan had to negotiate a partition arrangement after independence and this proved extremely difficult – leading to future military confrontations. Punjab, Bengal and Kashmir will be the focus of our study of how Partition has been represented on film. Who was actually responsible for creating this inevitability of Partition in 1947 is the most contentious issue in the history of the period. The most recent British film focusing on Partition, Gurinder Chadha’s Viceroy’s House (2017) lays much of the blame on the wartime British leader Winston Churchill and his attempts in 1944-5 to prepare for the threat of Soviet influence over an independent India. Nehru was seen as most likely to adopt a non-aligned but friendly position vis-a-vis Moscow and Churchill saw the possibility of an independent Pakistan as a Western ally, allowing British bases to remain in place. In a documentary screened on British TV in August 2017, Chadha explored this evidence further (referring to wartime documents held in the British Library). This programme suggested that Jinnah had met privately with Churchill and that the idea of Pakistan as a future ally against the Russians was widely shared by what Chadha termed as “the British establishment” – including the Royal Family and the military. The suggestion is, therefore, that the Attlee government was faced with a fait accompli policy that they were unable to alter. Indian historians and Indian filmmakers have tended to blame Jinnah and the British – either separately or together. ‘British India’ referred to what were in effect British colonies, locally administered by colonial civil servants and the India Office in London. In 1947 there were seven major provinces administered in this way and developed from the original ‘presidencies’ of Bengal, Bombay and Madras. The British Crown also had ‘suzerainty’ over some 500 plus ‘princely states’, ranging from large states such as Hyderabad and Mysore to tiny states of a few thousand. Each local ruler had to make a separate arrangement with the newly established dominions of India and Pakistan. The directly ruled colonies and the princely states together comprised the ‘British Raj’ established after the 1857 Indian Mutiny. It also became known as ‘the Indian Empire’. Religion was just one of the potentially divisive factors in India in 1947 and its impact was felt most strongly in the North. In much of Southern India, language differences and ethnic differences (i.e. the Dravidian South’s mistrust of the Aryan North) were more important. During the 1950s and 1960s, Indian government was re-organised to produce states based on linguistic groups. In the states of West Pakistan and East Pakistan after partition, the fact that the mass of the population in the East spoke Bengali and not Urdu was a major issue for any sense of ‘national identity’. We are concerned with representations of the events of Partition and its aftermath on film. One of the important issues for us is to identify which film industry has produced a film and who the ‘creatives’ (writer and director in particular) might be. There are many films about Partition issues as well as many filmmakers from diverse backgrounds. For this reason, I’ve tried to include something from each of the following categories (they are overlapping categories, so some films and filmmakers appear in more than one category). There is no ‘ranking’ in this list. Popular (mainstream) Hindi cinema – often now retrospectively termed ‘Bollywood’. Popular international or Hollywood ‘studio’ films. From the list above, it would be useful to distinguish between a film like Gandhi (1982), Richard Attenborough’s biopic, as an ‘international’ Hollywood studio film and Gurinder Chadha’s Viceroy’s House as an independent British film (with some Hollywood support) directed by a diaspora director – someone whose grandparents left Rawalpindi in 1947 and who now lives in the UK. The so-called ‘parallel’ or ‘middle cinema’ of India is difficult to define but it is clearly distinguished from the popular Indian cinema of multi-genre narratives and choreographed song and dance sequences. Parallel cinema was/is more ‘serious’ in its social concerns and character development. It is more difficult to distinguish between parallel and ‘art’ or ‘avant-garde’ cinema, the latter being in formal and narrative terms more experimental. What follows is an attempt to select extracts from films which represent Partition and in some cases its aftermath in Pakistan, West Bengal, Kashmir and Punjab. In some cases, longer posts are available discussing the films in more detail and I have included links where appropriate. This unusual biopic of the Muslim leader stars Christopher Lee in the title role. Director Dehlavi is a diaspora figure based in Europe and he used mostly British-based actors alongside Indian star actor Shashi Kapoor in this co-production with Pakistan that was controversial at the time of its release but has since been accepted in Pakistan. Despite being one of the most important filmmakers of his generation, Ritwik Ghatak’s films were not widely appreciated when first released. But when he went on to become one of the first tutors at the Indian Film Institute in Pune, he soon became an influential figure for younger directors. He was very much affected by partition, being forced to move from East to West Bengal. His trilogy of films in the early 1960s uses music and politics to explore the heartbreak of partition. (The other two films in the trilogy are Cloud-Capped Star (1960) and Komal Gandhar (1961). In Subarnarekha, Ishwar, a man in his late twenties and his younger sister Sita find themselves in a refugee camp in Calcutta where they acquire a stepbrother – a young refugee boy Abhiram who has lost his mother. This trio then find themselves in the western part of Bengal by the Subarnarekha River. The children grow up and fall in love, but the older brother can’t cope with events and breaks down, unable to escape from his past. In the clip above, the landscape is expressive of the despair and sense of exile and loss experienced by Ishwar. An important film for Indian cinema, Roja is an example of Tamil language popular cinema. Unlike Bollywood, which in the early 1990s preferred stylised fantasy films, Tamil cinema, and Mani Ratnam in particular, created romances set in ‘real’ situations. Roja (‘Rose’ – a symbol for Kashmir) sees a Tamil cryptologist working for Indian intelligence being sent to Kashmir with his young wife. Visiting an area close to the ‘line of control’, he is captured by a Muslim guerrilla group who want to exchange him for one of their own members imprisoned by Indian forces. The film won many awards and was hailed as a ‘patriotic film’, being dubbed into Hindi, Telugu, Marathi and Malayalam. It encouraged Bollywood to think of more serious issues as the basis for entertainment features. In this clip the cryptologist tries to talk to his captors. This mainstream Bollywood blockbuster was written by the director’s father, Javed Akhtar, one of the most acclaimed writers in Indian cinema. A young man (Hrithik Roshan) from a wealthy Delhi family attempts to give up his aimless life and eventually passes out of the Indian Military Academy. He is posted to Kashmir and given the opportunity to prove himself in action against Pakistani insurgents. The various conflicts on the Kashmir border/line of control feature in several Indian films, often associated with the ‘Kargil War‘ of 1999. The film shows Hindi cinema attempting to merge a romance (Pretty Zinta is the hero’s ‘lost girlfriend’, a TV reporter) with a story about young India’s indifference towards guarding its border. Ironically, the Colonel of the regiment is played by the supreme Bollywood hero Amitabh Bachchan. At the time Roshan was one of the young hopefuls attempting to replace Bachchan. The clip below is a ‘music video’ featuring the title song with scenes from the film. We see the hero in training and the role of the Army officer is shown as both heroic and glamorous. It’s worth noting that both the Indian and Pakistani Armies were created out of the British Indian Army in 1947, a situation which initially created the possibility of a civil war situation in which officers and men who had trained together might find themselves on opposite sides in a conflict. The Bollywood presentation suggests that today there is an American influence on how the image of the Indian military is constructed. This film, in Urdu, is one of the first examples of the ‘parallel cinema’ of the 1970s and 1980s. The title translates as ‘Scorching Winds’. They are mentioned in the first few lines of dialogue as threatening the flowering trees of the city of Agra (the city which is the home of the Red Fort and the Taj Mahal, two major symbols of the Muslim Mughal Empire in India). If not uprooted, the trees will wither in the heat. ‘Scorching Winds’ is also metaphorical and refers to the violence of communalism sweeping through India in 1947-8. The film deals with a Muslim owner of a small shoe factory. He decides to stay in Agra, but his brother moves to Karachi and gradually life becomes very difficult for the brother left behind. Garam Hava proved controversial even after more than 20 years since the events depicted. It had a delayed release because of fears of communalist violence. It was supported by the government agency, the NFDC and submitted as India’s entry for Best Foreign Language Oscar. In the interview above the director and scriptwriter discuss the film and its legacy in some detail. The interview in 2014 was conducted at the time of the film’s re-release. (You need to click on the link and watch the interview directly on YouTube). Earth is an adaptation of an autobiographical novel Cracking India by Bapsi Sidhwa, first published as ‘Ice Candy Man’ in the UK in 1988. The director Deepa Mehta was born in Amritsar in Punjab in 1950. She moved to Delhi as a child and graduated from the University of Delhi. In 1973 she migrated to Canada and started a film career as a writer and documentarist. She directed her first feature in 1991 and as well as English language features in Canada she has returned to India to make four features. Earth was the second film in her ‘Elements’ trilogy after Fire (1996) and preceding Water in 2005. All three films were controversial (Fire addresses lesbianism and Water, the treatment of widows in traditional Hindu culture). They were also highly praised and won prizes. Her 2012 adaptation of Midnight’s Children was less successful (but still well worth watching). Although this is a film from a diaspora director with photography by Giles Nuttgens from the UK, it is also a film deeply rooted in Indian cinemas. The music is by A. R. Rahman and the actors include the current Bollywood superstar Aamir Khan in an early role. Nandita Das is a star of Indian parallel cinema and other cast members are well-known in India. The film is part of the group of films, like Garam Hava that deal with the personal tragedies of Partition rather than directly with the political machinations. Like Train to Pakistan its focus on Punjab means that the complexity of religious, social and cultural relationships are explored in some detail. The film is set in 1947 in Lahore in Northern Punjab. The city has a Muslim majority but the household at the centre of the narrative is Parsee and the little girl who in effect ‘narrates’ the story has a Hindu nanny/maid (Nandita Das) who has a circle of friends that includes Muslims and Sikhs. The clip below shows the girl and the maid during the kite-flying festival and the maid is being wooed by the Aamir Khan character, the Muslim known as the ‘Ice-Candy Man’, one of his several identities. The kite-flying is a joyful competition which ironically underlines how the community will later be divided by the violence of the communal violence in the lead up to Partition. This is another film that received backing from NFDC as a later example of a parallel film. Pamela Rooks was a filmmaker born in Calcutta to an Army family, but the film (in Hindi) is set in Punjab. It’s an adaptation of a 1956 novel by Kushwant Singh, himself a major cultural figure in India post 1947. The trailer above does not have English subtitles but a subtitled DVD is available in the UK. The story is set in an Indian village in 1947 close to the new border with Pakistan. Despite the conflict all around them, the villagers, mostly Sikh landowners and a minority of Muslim labourers, live a peaceful life. The film explores, through various characters, how the peaceful village is drawn into the conflict. The village money-lender is killed when he refuses to open his safe for a band of Sikh dacoits. The local magistrate, befuddled by whisky and a young prostitute, sanctions the arrest of two men – one is a Communist Party member just arrived from Delhi and the other a local dacoit who never robs in his own village and who was sleeping with his Muslim girlfriend when the murder was committed. The magistrate and police attempt to frame both men, meanwhile a train filled with dead Sikhs arrives in the village and a little later, Muslim refugees on foot from India. Another diaspora director, Vic Sarin, made this film in English starring Jimi Mistry, Irrfan Khan and Neve Campbell in Canada. It takes the Sikh perspective on partition in Punjab. I didn’t see this fine film by Anup Singh until after the Partition Event. Please follow the link on the title above for more details. The film again stars Irrfan Khan as a Sikh in the Punjab at the time of partition. Anup Singh is also a diaspora director with a similar but also slightly different background to Gurinder Chadha. The films from which extracts have been taken have all been available in the UK on DVD except Garam Hava (which is available on YouTube or from India/US as a Region 0 DVD). Piku is one of the best releases this year in the UK. I laughed, fell in love, reflected on the faded grandeur of Calcutta and admired the writing, direction and central performances. The music by Anupam Roy wasn’t bad either. The eponymous character is an attractive young woman (played by Deepika Padukone), a singleton of around 30 working in Delhi as a partner in an architectural design company. Her busy life is complicated by the demands placed on her by her 70 year-old widowed father, a hypochondriac constantly complaining about his constipation. When he demands a trip to Kolkota to visit the house he still owns (and where his brother still lives) Piku discovers that her reputation as an angry passenger has alienated all the taxi drivers in a local company. Father decides they must be driven to Kolkota (1500 miles away), so the taxi company boss (who has his own reasons for leaving Delhi) has to take the job himself. Since father is played by Amitabh Bachchan and the taxi boss by Irrfan Khan we are guaranteed an entertaining ride. Irrfan Khan and Amitabh Bachchan discuss diet and bowel movements. At this point I should point you to Omar Ahmed’s posting on the film. I’m indebted to Omar for several insights into how the film works. I’ll try not to repeat things he says and offer instead some extra points. I first came across the director-writer partnership of Shoojit Sircar and Juhi Chaturvedi when I watched and very much enjoyed Vicky Donor (India 2012). That film dealt with the social issue of sperm donation and the idea of ‘designer families’ and the impact on the sperm donor. It too employed comedy and featured a Bengali family brought to Delhi (Sircar is a Bengali). The effectiveness of that film derived from the acute observation of people in potentially embarrassing situations in which they are allowed to react naturally. This is a form of social comedy approached with genuine humanism and in Piku Sircar and Chaturvedi utilise the family melodrama and the road movie in constructing their comedy narrative. In doing so they create a narrative about a ‘real’ (upper) middle-class Indian family. ‘Real’ in contrast to the ways most families are depicted in mainstream Hindi cinema. The film could be universal except for the one aspect of Indian middle-class culture that remains beyond my understanding. There is a fourth character in the car – a servant who acts as something like the old man’s ‘batman’. He rarely speaks and is largely ignored by the other three characters, except when he is needed. The careful attention to detail in the script is illustrated by a scene in which at the beginning of the car journey the servant climbs into the front passenger seat next to the driver. The driver refuses to move and apart from a few glances in the rear view mirror, nothing is said until Piku changes places with the servant. Rana, Irrfan Khan’s character is an educated man, a civil engineer who worked in Saudi Arabia before taking over the family business. He needs to assert his social status – important to him as he must grapple with Amitabh’s Bengali patriarch Bhaskor Banerjee. Later we learn that Rana has a Bengali family name (Chowdhury) even if he comes from Uttar Pradesh. This makes him at once potentially acceptable, but also inferior to Bhaskor. These nuances, as Omar suggests on his blog, point us towards the kinds of narratives explored by Satyajit Ray. Piku is a familiar Ray woman – introduced in the opening sequence by a full length poster of Ray. Later she dismisses a potential suitor because he does not appreciate Ray’s films. Piku has been a big hit in India – and in South Asian diaspora communities overseas. The reviews still reveal a significant portion of detractors – many perhaps angry that there seems so little in the way of ‘plot’ and excitement with three major stars. The music is all used to support the narrative without disrupting it – there are no romance set pieces or choreographed dances etc. Only a bicycle ride through traditional Calcutta (reminding me of Ray’s Mahanagar at times) breaks away from norm. The pleasures in the film come from the script and the performances. In the UK a specialised film distributor was able to make a considerable killing with the ‘Indian Independent’ film The Lunchbox (India 2013) starring Irrfan Khan. Piku has been a success for Yash Raj in the UK (two Top 15 appearances in its first two weeks) but it won’t have been seen by the same audiences that enjoyed The Lunchbox. How to put these two audiences together is an intriguing question – but I wonder if either the Indian or UK distributors really want to try? It’s somehow indicative of the lack of interest shown by Indian distributors towards audiences outside India and its diasporas that there are no subtitles on the trailers for most new releases (even though the films themselves are subtitled). This trailer over-emphasises the romance elements and the relationship between Piku and Rana is developed in understated and subtle ways. Raj Kapoor and Nargis in Awara, 1951. These films represent a rich and varied cinematic heritage that is in danger of becoming extinct. 1700 silent films were made in India of which only 5 or 6 complete films remain. [These were screened at Le Giornate del Cinema Muto in 1993]. Tragically, we have lost our first sound film Alam Ara (1931, the film that established music, song and dance as the essential ingredient of popular Indian film). By 1950, India had lost seventy to eighty per cent of its films, and this has been the result of a widespread and complacent belief that film will last forever. We now realise that these eight classics too are in imminent danger of being lost to the world if urgent steps are not taken for their preservation and restoration. Screening these film is not just a reminder of a singular cinematic legacy, but one that is endangered and must be saved. Chandralekha, 1948, black and white, in Tamil, 193 minutes. The film’s primary conflict – the struggle between the usurper and the rightful heir – would have resonated strongly with Indian audiences, leading them to register all the nuanced allusions and metaphors embodied in the film. Awara, (The Vagabond), 1951, black and white, in Hindi, 168 minutes. This is a film directed by and starring Raj Kapoor, one of the most popular stars in the history of Indian cinema. Alongside him is Indian greatest female star, Nargis. And the film was produced at Kapoor’s own studio, built from the profits of his earlier successes. The film runs for 168 though there was a longer version of 193 minutes. The film, Kapoor and Nargis were also immensely popular in the Soviet Union and Arabia and China. Kapoor’s character is clearly influenced by Chaplin and he exploited the persona in a number of films. The film follows the son of a judge, unfairly expelled from home and who grows up in the slums and is tutored by criminals. The film ends in a courtroom, where both romance and the father/son conflict are resolved. Do Bigha Zameen (Two Acres of Land) 1953, black and white, in Hindi, 142 minutes. Audiences around the country greeted it with stunned silence. There was no boisterous acclaim, none of the celebratory music that follows the news of a film becoming a box-office success. It was an acknowledgement that a new kind of cinema had emerged: a cinema in the popular mode, with the ring of truth. Pyaasa (The Thirsty One) 1957, black and white, in Hindi, 143 minutes. In Pyaasa Guru Dutt disregarded the conventions of Indian cinema regarding songs. He could use them in fragmentary form or as an extension of dialogue, while at other times, they went beyond the standard length. encounters greed and philistinism among the gatekeepers of society, and compassion among its outcasts. Mother India 1957, in colour, in Hindi, 172 minutes. combines the characteristics of both Mother Courage and Mother Earth. Through her we traverse the epic journey of a country from darkness to light. The filmmaker Mehboob Kahn, like the Government headed by Nehru, was strongly influenced by the Soviet model. In one glorious dance number the peasants in the fields combine in the form of a hammer and sickle. Ajantrik (Pathetic Fallacy) 1957, black and white, in Bengali, 102 minutes. Literally, the tile Ajantrik extends the word ‘jantrik’ (mechanical) to suggests its antithesis. It is something that is alien. [T]his apathy may be due to the fact that all change and the very introduction of the machine age was the handiwork of foreign overlords. the forces driving the speed of change disregard and thus destroy the slower, more human tempo at which people adopt and incorporate change into their networks of social relations. 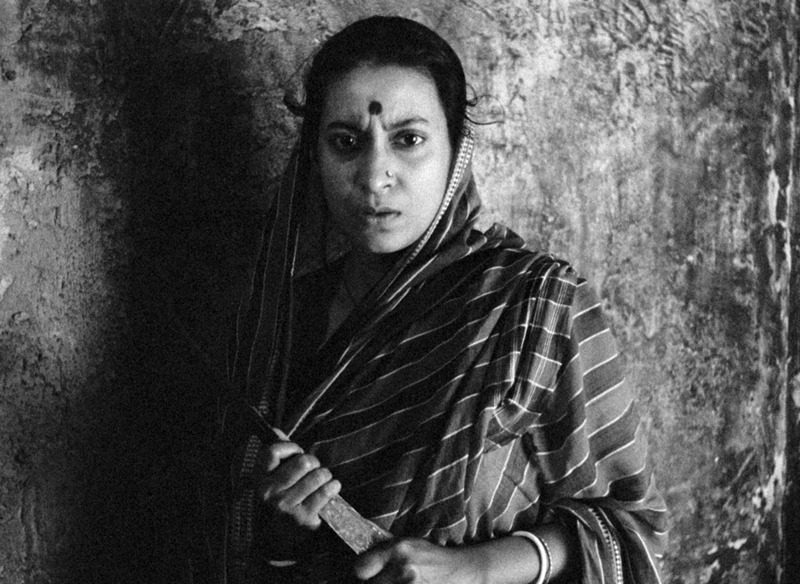 Madhumati, 1958, black and white, in Hindi, 149 minutes. This was the second film directed by Bimal Roy in the programme, and was scripted by Ritwik Ghatak. It features one of the popular stars of the period Dilip Kumar as Anand. The plot involves a haunted mansion, ghosts and reincarnation. The film falls within a genre known as Indian Gothic – which will give some sense of its style and atmosphere. The film was immensely popular and weaves the generic tale into a tapestry of songs, dances, folk-style humour and traditional tropes. Kaagaz Ke Phool (Paper Flowers), 1959, black and white CinemaScope, in Hindi, 144 minutes. This was the last film on which Guru Dutt put his name as director. It is a doomed tale of a successful filmmaker whose career goes into decline when his personal life goes awry. There is a strong element of autobiography in the film: Dutt committed suicide in 1964, aged only 39. Dutt plays the lead character Suresh, whilst his favoured actress Waheeda Rehman plays Shanti. The music is by S. D. Burman, though the songs and dances are not integrated into the film story as well as in the earlier Pyaasa. What is most memorable about the film is the cinematography by V. K. Murthy. This was the first occasion that I was able to see a film print in the full widescreen format; earlier screenings had been cropped to 1.37:1. This is a film of shadows, which are used in an exemplary fashion. The chiaroscuro lighting in many of the studio sequences is beautifully done. 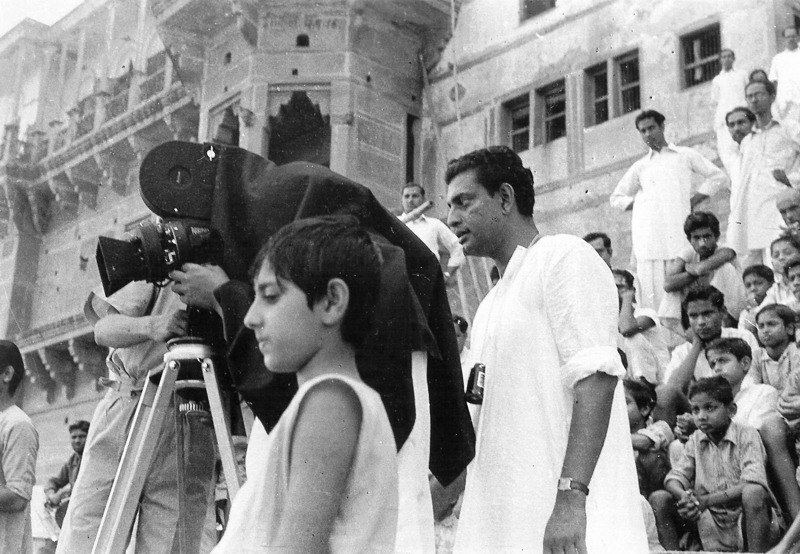 Dutt and Murthy also have a mastery of the crane shot, with one striking flowing camera movement during the climatic sequence of the film. The screenings were preceded by Indian Newsreels of the period, some of more interest than others. The films were mainly screened in 35mm prints, the majority from the National Archive of India. Unfortunately three films were screened from Blu-Ray discs, not a format that could do justice to these great films. When there were not subtitles on the print digital titles were projected in both English and Italian. We did miss the lyrics for several songs in this way. Andiram and Aditi meet in the dining car. Nayak (or The Hero) was not released in UK cinemas, a relatively rare occurrence with the films of Satyajit Ray at a time when he was at the peak of his fame. There are various reasons why the film might not have appealed to UK distributors (assuming that it was available). It would be sad if it was because the film seems less ‘realist’ and certainly less concerned with the ‘exoticism’ of India – two traits appreciated by the supporters of Ray’s earlier village-set and ‘historical’ works. Perhaps it seemed inaccessible because despite its modernity it deals with Indian [upper] middle-class mores that were more difficult for the Western audiences of the time to understand. It also feels like one of the most carefully ‘constructed’ of Ray’s films. It shares with Kanchenjunga (1962) an original screenplay by Ray himself (many of his other films are based on Bengali novels) and a range of characters brought together in a controlled space. In Kanchenjunga it is the promenades of Darjeeling and in Nayak it is an express train travelling between Calcutta and Delhi. Andrew Robinson in Satyajit Ray: The Inner Eye (revised 2004) writes very well about this shared set-up and he describes it as a “microcosm of Bengali middle-class sanctimoniousness”. But it also seems to me that Ray himself is rather sniffy about his characters (or that’s the impression I get from Robinson) – which is dangerous because the central narrative line explores something close to Ray’s own experience. The ‘Hero’ is Arindam Mukherjee, a major star of Bengali popular cinema who has been invited to Delhi to receive an award. Because he has left his arrangements late he must take the train from Howrah instead of flying. Apart from the opening sequence, the whole narrative is played out on the train, though several earlier parts of the story are revealed through flashbacks. Ray decided to cast a ‘real’ star of Bengali cinema, Uttam Kumar, in the title role, arguing that although he didn’t value ‘commercial cinema’ he did think that certain actors had talent which he could utilise. Robinson’s description of Ray’s feelings about working with Kumar suggest that the director behaved quite badly and indeed he seems to have patronised the actor. In order to pursue his own ideas about cinema and to raise questions about stardom, Ray wrote the second main character as a rather serious young woman who is the editor of a women’s magazine. Aditi (Sharmila Tagore) is pushed by her travelling companions into interviewing Arindam even though she herself is dismissive of popular cinema. Thus Ray is able to raise questions about ‘realism’, ‘conscience’ etc. in relation to cinema, especially since Aditi is sat in a ‘chair’ coach (i.e. the cheaper seats) and the couple meet in the dining car. Aditi is thus the ‘outsider’, commenting indirectly on the privileged world inside the sleeper. The other passengers in the First Class sleeper include a businessman and his family, a elderly writer and an advertising executive with his younger wife. In the flashbacks we see the actor during incidents in which he has often behaved badly. We also experience two of his nightmares when he tries to doze off. I suspect that it is these scenes that put off distributors in the West. Ironically, Ray is using devices that might have appeared in Hollywood or Hindi cinema films from the 1940s/50s (though in his blog Omar refers instead to Fellini and Bergman). Robinson tells us that most of the film was shot in a studio in Calcutta, yet there are several shots of the railway. I did feel that the sleeper was much more ‘modern’ and luxurious than the Indian Railways trains that I have ridden – but probably I wasn’t in the ‘best’ carriages! Overall, I enjoyed the film. I thought Uttam Kumar was very good, as was Sharmila Tagore. I didn’t mind the flashbacks and although they are ‘traditional’ rather than ‘modernist’, they do signal a shift in Ray’s practice to include more non-realist material and this became a more common feature of his work in the late 1960s and early 1970s. However, Nayak still qualifies as a ‘humanist film’ in which Arindam has all his weaknesses exposed but emerges at the end as a rounded character with his good and bad points – much like everyone else. The more I think about the film, the more interesting it gets. A man and a woman meeting on a train, especially in a dining car, is a feature of several classic romances and thrillers – Hitchcock’s The Lady Vanishes and North By Northwest for instance and the opening of Richard Linklater’s Before Sunrise. But Ray subverts our expectations. The couple do not develop the kind of romantic relationship we might expect, instead we get a much more (intellectually) interesting relationship that develops as Aditi learns more about Arindam. In the same way, although we learn about Arindam’s life, this isn’t a critique of the film business as such. Marie Seton, in her Portrait of a Director (1971), writes very well about the meanings of Nayak. She suggests that the film tells us a great deal about the people in the sleeper compartment and also explores several aspects of Bengali society. For instance, she comments on Arindam’s handling of cash and his fears about losing his successful box office position, pointing out that the prevalence of so-called ‘black money’ in the financing of popular films in India at the time generated insecurity. Arindam’s background includes references to the Bengali theatre tradition and to left-wing politics – again ‘local’ factors in Bengali life in the 1960s. I was intrigued that the advertising man’s wife is called ‘Molly’. I wondered if this was an Anglo-Indian name? Or is it simply a corruption of a Bengali name? As Seton suggests it is these touches that make the film so rich in meanings. Channel 4 celebrated the 100th Birthday of Indian Cinema with five late night/early morning screenings of Satyajit Ray films. Perhaps we should question this strategy – why not five different directors? But this is what we got and at least Channel 4 (a pale shadow of its former self these days) still shows Indian films. I’m certainly grateful for the chance to see Ray’s last film which turned out to be a very enjoyable watch and a moving tribute to the director and to Indian cinema. Most of the film is set in the confines of the Bose household – in the living rooms and bedrooms – with a brief sequence on the Maidan where Mitra meets Satyaki’s friends. Significantly, it ends with a trip to the rural area where Rabindranath Tagore developed his education communities at Santiniketan (and where Ray studied). Mitra shares Ray’s interest in music and his main interest is in anthropology which he has pursued by travelling the world and living with various communities ‘outside’ bourgeois society. Ray also explored the tension between the Calcutta bourgeoisie and the rest of Bengali society, most clearly in Days and Nights in the Forest which has several echoes in Agantuk – the final section of the film includes a dance sequence involving a group of Santals (‘tribal people’). Mitra’s arrival challenges the materialism of Calcutta society and in confrontations with Anila and Sudhindra’s friends and colleagues, Mitra questions whether Bengali intellectual life has really sustained the vigour which Tagore instilled in it and whether or not it is too much in hock to Western values. It’s significant that the film was made just at the point when the Indian economy was beginning the process of ‘de-regulation’ – there is a nostalgic reference to Thums-Up, the local Coca Cola substitute (Coke was not available in India during the 1980s). The film has been described as a comedy and it is true that there is a lightness about it, but also I think it offers a serious critique in what seems like a very personal statement. The playing of all the roles is very good but in particular Utpal Dutt as Uncle Mitra really nails it. Kolkata is a city steeped in memory and cultural history. The principal city of British India, it has over the last fifty years fallen behind Mumbai, Delhi and Chennai in terms of economic development. But it won’t give up its self-image of ‘cultural capital’. 2011 marked 150 years since the birth of perhaps the greatest cultural icon in Bengal, Rabindranath Tagore – the Nobel Prizewinning writer of poetry and prose and the great polymath of Bengali culture. The Sound of Old Rooms is both a celebration of Tagore’s influence and cultural legacy and an attempt to look forward to the future. Sandeep Ray’s film focuses on teacher-poet Sarthak Roychowdhury. The filmmaker made an earlier film about the poet’s family and here he uses some of the earlier footage to trace the life of his ‘character ‘ from his college days through to the publication of a book of his poetry and up to fatherhood in his early forties. The 72 mins film uses a variety of formats from 8mm film to contemporary digital video footage. For anyone who became interested in the world of Bengali students and aspiring intellectuals as seen in the films of Satyajit Ray, Ritwik Ghatak and Mrinal Sen in the 1950s and 1960s, this is a fascinating film. (But Sandeep Ray is not to be confused with Sandip Ray, the filmmaker son of Satyajit Ray.) But even without that background, audiences should quickly warm to the central character. Two of my favourite scenes concern the visits Sarthak makes to his literary agent/publishing broker. This wily character does a quick calculation on the margin of a newspaper page and agrees to find a publisher for Sarthak’s poems, confident that he will make a profit. Years later he appears to be hoarding the last few copies of the book which has nearly sold out its 500 copy print run and he tells Sarthak that Tagore didn’t have that level of success with his first publication. These are the kinds of scenes you don’t normally get in an arts documentary – the agent trying to open the bottle of booze that Sarthak has brought as a gift, Sarthak grilling the agent’s assistant to find out if there are secret copies. I like the reality of the writer’s life that the film presents. On the one hand, Sarthak has used up all his creative energy in producing this first book and faces the usual problem of how to follow it up. In the meantime he has to earn money giving home tuition and taking teaching jobs outside Kolkata. At one point he has to take empty beer bottles back to a shop and is dismayed that the return deposit rate has dropped. At other times he chides taxi drivers for trying to overcharge him by a rupee (a rupee is worth not much more than 1p in UK money). But the film is also about Sarthak’s family and the old three-storey building in which they have always lived. We meet his parents and eventually his wife Ritu who Sarthak met at university. Sarthak’s father is mostly in the background but his mother and Ritu feature strongly. Sarthak’s relationships with the two women in his life are structured around tradition and modernity. At one point he reminds Ritu that she has come to live in Sarthak’s parents’ house just like his mother and his grandmother before her, but at another point he says “we got our Masters in friendship, now we’re working on our PhD in relationships”. Ritu and Sarthak’s mother are both strong characters and very likeable. The film is full of fascinating juxtapositions. In the cluttered old house with little more than a bed and some bookshelves, Sarthak and Ritu happily slurp bowls of Maggi instant noodles and in an old bar they discuss Gayatri Spivak (and Jacques Derrida in a taxi). At other times we see them taking train trips in much the same way as those characters in the earlier Bengali movies. Ritu teaches full-time up until the birth of her son. The birth changes the lives of Sarthak and Ritu and this is the film looking forward – even if the whole family will still be listening to the sounds of old rooms. Sarthak wants his son to be aware of the memories in the house even as he looks to the future. This documentary has been very successful around the world and there is a useful Facebook page detailing its progress through various festivals. The filmmaker also has a website. I found the film fascinating and hugely enjoyable. Sarthak is the filmmaker’s cousin and he participated in the production as well as being the subject. This relationship is only evident in the ease in which Sandeep Ray is able to present the events of Sarhak’s life on screen. There is never a moment when we feel that we are voyeurs or that the scenes are being manipulated for the camera. There are snatches of his poetry throughout and a music score by Sion Dey. I’d like to see the film again to get a full appreciation of both the poetry and the music. If you get the chance to see it, don’t miss it.